Visit us on Skype or FaceTime to see your puppy. It's like being here in our home. Just call us for an appointment. we selected our name to acknowledge the Chinese origin of the breed. translates into English as Body-of-Christ or into Latin as Corpus-Christi, our hometown in Texas. We are Pam Crump (a retired teacher) and Luke Crump (a retired CPA). (See our About Us page.) We met and married in 2002, and after retiring we chose to raise and show AKC Shih Tzu. After remodeling our home to accommodate our pets, we began searching the world to find the very best Shih Tzu puppies we could for pets we would breed and show. After making some mistakes in our early selections, we concluded that the best assurance of producing top quality puppies was in selections based primarily on pedigrees. Since ancestors pass on their physical and personality traits to future generations, getting puppies with Champion packed pedigrees from quality Shih Tzu breeders was the best way to achieve excellence in puppies that would conform well to AKC Breed Standards. We are proud of the health of our puppies. We give a written two-year health guarantee (or limited warranty), which provides for a full refund of the purchase price if the puppy should be diagnosed with a fatal genetic health condition. None of our puppies have ever failed under the terms of this guarantee. We realize that buyers are not so much looking for their money back as they are for a healthy puppy. With us, buyers can see (from the liberal terms of our written guarantee) just how much confidence we have in the health of the puppy they will be getting. All of our Shih Tzu come with an AKC Registration application or certificate. For pet homes we offer a lower price (for the limited AKC registration) than we ask from a breeding home (for the full AKC registration). We have produced Shih Tzu in virtually every color and marking that is available in Shih Tzu, including Gold, White, Black, Red, Silver, Brindle, Cream, Blue, Liver, and Chocolate, in solids as well as Tri-Color (or Parti-Color), even including the rare and highly sought “Dobie” marked Shih Tzu. Most of our puppies will grow up to be in the range of 8 to 12 pounds as adults. We do occasionally get the tiny puppy that will weigh less than 8 pounds as an adult, but we never refer to any of our puppies with the hyped-up marketing terms of “Imperial” or “Pocket Puppy” or “Miniature”. The American Kennel Club (AKC) and the American Shih Tzu Club (ASTC) do not condone erroneous labeling practices like this, stating instead that the appropriate adult weight for this breed is between 9 and 16 pounds. An adult weight of less than 9 pounds is considered substandard. We sometimes have adult Shih Tzu available for placement. We begin looking for a suitable pet home for them as early as four years of age while they are still young and vigorous enough to be attractive to pet buyers. 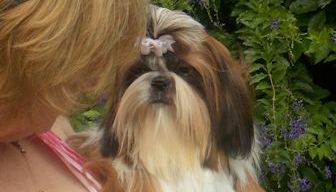 We also offer stud service to select AKC Shih Tzu females. As a buyer of one of our Shih Tzu, you will become a part of our growing Shih Tzu family. We still maintain contact with most of the families who have gotten puppies from us, even as far back as Pam’s first litter of puppies in 2000. The Shih Tzu is classified by AKC as a Toy Dog breed. They make an excellent sturdy companion dog or lap dog, and are hypoallergenic. Our Shih Tzu allow us to live in their home as long as we keep food bowls and water bottles filled, treats given regularly, clean beds and toys, and both of our laps filled with one or two dogs when we get the occasional respite to sit and watch TV. Of course, some rooms are utilized just for them, such as the master bath for grooming and master bedroom for the new puppies. We have retreated to the guest bedroom. Even there, several of them curl up with us, which is appropriate, for we are, after all, guests in their home. When we are good, we are allowed to take short trips from the house, such as going for dinner and dancing, but only when they will be sleeping or not demanding our help to deliver new pups. They are quite happy when the first activities of our day include keeping their living quarters clean, making sure their vet appointments are on time and grooming them on a regular schedule. 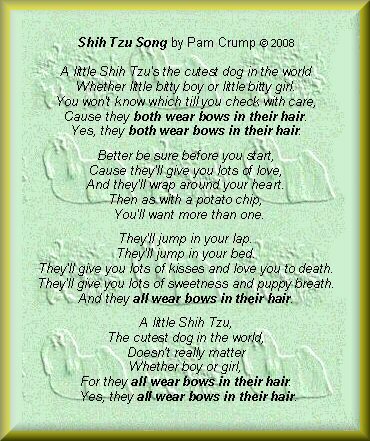 So if you would like to be owned by a Shih Tzu, call us and we will introduce you to a puppy of your choice.